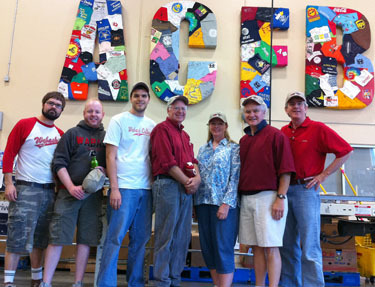 2011 Wabash Day - Atlanta, Ga.
Wabash alumni from around the greater Atlanta area gathered at the Atlanta Community Food Bank on Saturday afternoon for W.A.B.A.S.H. Day. After learning about the mission of the food bank and receiving some helpful tips on food bank procedures, alums joined other volunteers in sorting a variety of donated food and non-food items into boxes for later distribution. At the end of the day, the coordinators reported that the volunteer group had successfully sorted 12,040 pounds of food during its shift, which will go out to over 8,000 people.